Nvidia unveiled their latest mobile GPU, Tegra K1 at CES 2014 few days back. As its architecture suggests K1 chipset relies on a potent 192 core graphics processing unit which, in Nvidia’s words, is more powerful than the GPUs inside the PlayStation 3 and Xbox 360 consoles of old and three times that of the iPhone 5s GPU. We have seen few Nvidia made demos at their booth which were awesome. But today new benchmark result is surfaces and we are shocked to see how Nvidia Tegra K1 blown the result sheet with desktop class graphics. 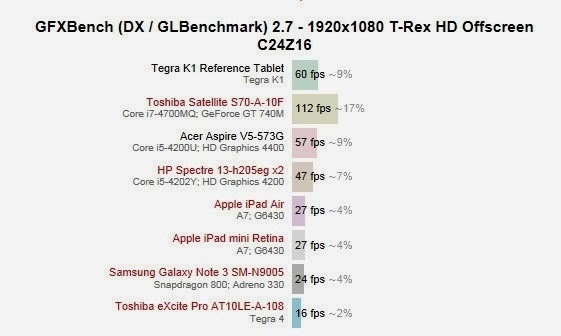 Appearing on GFXBench’s T-Rex 1080p off-screen benchmark the K1 GPU, running on a reference tablet, achieved 60 frames per second, besting the Tegra 4′s 16 fps, the Snapdragon 800-powered Galaxy Note 3′s 24 fps and the iPad Air’s 27 fps by a significant margin. The result is almost 4 times faster than current generation Tegra 4 GPU. More interestingly the K1 outperformed some integrated GPU’s on full OS chips – the Intel HD 4400 and 4200 which are part of the recent Core-i5 APUs got 57 and 47 respectively – lower than the Tegra’s 60 fps. Only the dedicated Nvidia GT 740M GPU managed to blast the K1 with a 112 fps score. It’s a very impressive statement. I can’t wait more to see the Nvidia K1 chipset in action on a real world. Hope we can see Tegra K1 tablets in Q2 2014.